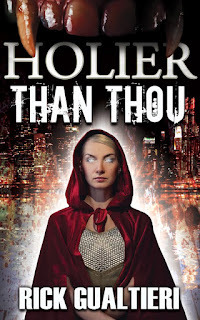 The Poptart Manifesto by Rick Gualtieri: Holier Than Thou - Teaser 1, Blurb, and Cover. Holier Than Thou - Teaser 1, Blurb, and Cover. Running through the thick forest, I felt truly alive. They say that man is the ultimate predator. If so, should he not also make the ultimate prey? It’s a thrilling concept. Now imagine taking that to the ultimate level...hunting a predator that’s even higher on the food chain. There’s a fitting reason it’s called the most dangerous game. The woods were pitch-black, but that wasn’t enough to even barely slow me down. My supernaturally attuned eyes cut easily through all but the darkest of gloom as I sought out my target. She thought she could evade me, perhaps even turn the tables and win. She would soon find out how wrong she was. As I pursued her through the forest primordial, a small voice in the back of my head reminded me that I should be cautious. She was far more dangerous than the others. I indulged myself and thought back to them, the ones who had already been dispatched - two humans, frail and weak. In another life they had meant something to me, but not out here. The one called Ed had been the first to fall. She had seen to that. Tom was next, by my own hand. I had sensed his impending betrayal and been the first to act. He had begged for mercy, but I had shown none...such is the way of my kind. I stopped and got my bearings, letting my senses expand around me. Sounds, sights, and scents filled my very being. The feeling was incredible. For one brief terrible moment I was tempted to throw back my head and howl primal defiance at the moon, but I knew that would be foolish. She might be listening. Though I felt no fear at facing her, I had no intention of giving her any edge. There...a scent, hers. It was intoxicating - awakening a deep need inside of me - but I pushed those thoughts away. I was here to hunt and would not be distracted so easily. I honed in on her smell, letting it play out across my hyper-sensitive nostrils for a moment before once more bounding off into the darkness. I savored the feel of the weapon in my hand. It would do nicely. If I so chose, she would never see it coming. It would be quick and clean...if I wanted it to be. I didn’t, though. I wanted her to know who had hunted her down. The look upon her face as she realized I was the one who had vanquished her would be too much of a prize to turn down. I smiled in anticipation and quickened my pace. Victory was mine for the taking, as was fitting. Even amongst predators, I am at the very apex. My name is Bill Ryder and I’m a vampire, an immortal beast of the night - but that’s not all. I am the legendary Freewill of vampire lore. The others speak of me and my coming in hushed tones. A great destiny has been foretold for me. Much honor and glory shall be laid at my feet one day. Feh! Let them keep their prophecies. I do not exist for them or the future they proclaim for me. No, I live only in the here and now...and right now I was closing in on my prey. There! A lesser being might have missed it, but not me. I could see the fabric of her jacket peeking through the foliage. She was lying in wait for me, hoping for an ambush. She was a smart girl, but sadly not smart enough. I circled her position, keeping myself outside of her range. I moved as quickly and quietly as I was able, thus none save perhaps another of my kind would have been able to tell of my passing. Therein lay the challenge. Though not sharing of my lofty status, the one out there had skill and power of her own. She might very well be able to sense that I was advancing upon her. Thinking quickly, I bent low and picked a few pebbles from the ground. I held my breath and counted to ten. When I made my move, it would have to be fast. The ruse would only fool her for seconds at best. Now! I stood and threw the stones back in the direction from whence I came. They rained down from the sky, disturbing the area where I had been only moments earlier. Before the last of them had hit the ground, I was once again on the move. Bringing all of my considerable speed to bear, I raised my weapon and advanced upon her hiding spot. She never saw me coming. There was no movement from the spot where she hid, so intent was she on waiting for me to fall into the trap she had set. Weapon ready, I at last made my presence known. Whoa! That chick has scary dead eyes. my brain goes right to paint ball! so excited for this to come out! When's the release date? I'm certainly looking forward to this. P.S. This line is epic-ly placed: "Talk about being damned if you do..."